When I'm in a hurry to get home, I occasionally come to the realization that -- horror of horrors -- we're out of general dinner drinking wine. Yes, yes -- hard to believe, I know. That leaves me with two options. Either I can traipse down to the cellar and snag a bottle from our "occasion" wine stash, or I can duck into the wine store on the way home. The latter is usually the path of least resistance. At such times, sometimes I don't have a wine type in mind other than general color. Something middle-of-the-road that doesn't get overwhelmed by whatever food's going to be on the table -- yet flexible enough if we end up calling a gustatory audible. There's also that "if it's not a special pairing, I don't want to spend a ton" aspect. When in doubt, I head down the Spanish aisle. As I've mentioned a few times before, Spanish wine is some of the best inexpensive wine on the planet if you're looking for an easy food pairing. Spain gave us tapas, after all. If you're having wine with tapas, it's got to handle any number of spice, meat, and vegetable combos. Much Spanish wine that you'll find is going to be consistently decent. Region: There are more than 50 wine regions in Spain. In the States, however, there are a few you'll run into more than others. Rioja, Rias Biaxas, Ribera del Duero, Navarra, and Rueda are in the northern section of Spain. You may also see a few from Priorat or Penedes -- the latter of which is the source of most cava -- Spanish sparkling wine. In the south are Jumilla and Alicante. In the southwest is Jerez, the home of sherry. Most regions produce both red and white wines. The regional differences (outside of sherry and cava, of course) aren't as broad as in Italy or France, so you usually don't need to worry so much about this. Age: Spanish wines historically were aged for quite some time. This is not always the case, but the naming conventions remain. Crianza means that a red wine has been aged for 2 years with at least 6 months of it in oak; whites and rosés -- 1 year with 6 months in oak. Reserva reds are aged for at least 3 years with at least a year in oak; whites are 2 years/6 months in oak. Gran Reserva reds are aged 5 years with 18 months in oak; whites are 4 years/6 months in oak. Wines with those designations tend to be a little pricier. If you don't see any of those designations, that means that there's probably been little or no barrel aging, and the wine is made to drink young. Grapes: Spanish wines are made from hundreds of indigenous varietals, but there are a few used more widely. The bulk of red wines are made from either Tempranillo, Garnacha (Grenache), and Monastrell (Mourvedre). Whites are made from Albarino, Garnacha Blanca, Verdejo, or Viura. Among the "everyday" Spanish wines, the reds tend to be medium-bodied with solid acidity, not overly tannic, and at least somewhat earthy. Whites tend to be fragrant and acidic as well (although Albarino tastes like honey), with citrus and melon flavors. For comparison -- the reds are somewhere between pinot noir and zinfandel. The whites are often similar to sauvignon blanc. Vinos de Terrunos 2006 Esencia de Monte -- This is a big, fruity Spanish red, made from 100% Monastrell. Lots of blueberries and wood shavings on the nose (bigger nose for a Spanish wine), even though there's no oak used in the production of the wine in any way. Also entirely organically farmed. The body is fairly full and there's some more thick dark fruit and licorice that leads to an almost coffee-ish finish. With a beer-braised chicken and lima bean stew flavored with plenty of garlic, thyme and paprika -- an excellent pairing. $15. Raimat "Vina 24" 2008 Albarino -- Light nose of wildflowers and lemon zest. An acidic body that tastes a little like lemonade made with honey. Finish is lemony, a bit tart, with a little lingering minerality. A very pleasant wine for an aperitif. We also tried it with a homemade veggie pasta -- grape tomatoes, basil, and oregano sautéed in garlic and olive oil and tossed with homemade linguine. Acidity stood up nicely without overpowering some of the fresh vegetable and semolina flavors. Very nice. $11. Finca Luzon 2006 Altos de Luzon Jumilla -- An interesting nose of plums and figs greets you here. It boasts a full-flavored body of dark fruits like blueberries and a real backbone of earthiness. Finish is spicy and acidic. This is a fantastic wine for pairing with big, rich foods. We had this with a veal & mushroom stew and it was absolutely outstanding. $16. Vevi Rueda 2008 Verdejo/Viura -- An interesting blend of these two major white grapes. In the spirit of Nigel Tufnel, we asked, "How much more grapefruity could this wine be? The answer is none...none more grapefruity." Any fan of tart sauvignon blancs would really enjoy this wine. It's pleasantly acidic and refreshing, and exceedingly food friendly with light meats or fish. We had it with grilled snapper. For $9, a really solid value. Welcome to the March installment of the Wine/Dinner of the Month Club for my dear Christine. You may recall that last month was a pretty hearty affair with bruschetta, lasagna and a fairly rich dessert paired with a Super Tuscan wine. This month, we went lighter for both the meal and the wine. It turned out great, and once again Mike at the TNV was spot on with the wine recommendation. Bon appétit. 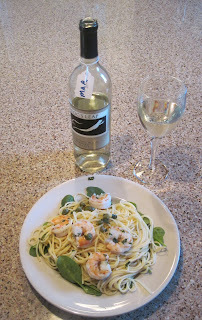 Mike suggested a light preparation of seafood to go with the sauvignon blanc. Christine is not a huge fan of seafood, so I thought this could be a challenge. After a little internet searching I found the shrimp recipe above. It is definitely a light dish with very little in the way of ingredients beyond the pasta and shrimp. Christine was in Texas that week helping take care of her nephews and sell her sister’s house (what a saintly sister) so I had plenty of time to go shopping and make preparations. Everything was pretty easy to find at our local Kroger grocery store. One snag was with the shrimp. I’ve never actually cooked shrimp and the first thing I did was go to the fish counter and ask for a pound of pre-cooked cocktail shrimp. Fortunately I realized my mistake right away and had the clerk give me the uncooked shrimp. I can safely say, don’t be afraid of the shrimp. Once you drop it in boiling water, it cooks up in about three minutes perfectly. One other issue I had to deal with was the basil. The recipe called for fresh basil. Being March in Cincinnati, the only “fresh” basil I found was a small bag of hydroponically grown stuff that was a little wilted. But it worked in a pinch. Christine got home around 3:00 pm on Saturday, March 27 and went straight to bed because she was totally exhausted. I started doing some prep work around 4:00. Mainly I segmented the citrus for the ambrosia salad and peeled the shrimp. One tip is that when you buy fresh shrimp ask if it has been de-veined (mine was). If it hasn’t, you’ll need to do that as well. Around 5:30 or so, I started preparing the meal in earnest while Christine revived herself. I opened the wine, and we sat down for dinner a little after 6:00. It was a pretty quick prep time for all the courses, so it would be something that could be whipped up on pretty short notice. As I mentioned, the shrimp pasta was very light in flavor. The capers provided the strongest flavor, but there were few of them in the dish so they were not overpowering. The olive oil provided some moisture to the pasta and the lemon juice gave just the right amount of tartness and citrus punch. Because the flavors in the dish were so light, the wine was really able to show through without being covered up. The wine had very bright fruit flavors of citrus and pineapple and went very well with all the flavors in the dish, including the slight bitterness provided by the baby spinach. After the pasta course, we took a little break while I prepared the salad. It was a simple mix of greens with cucumber and raisins. I had mine with a creamy ranch dressing and Christine had hers with strawberry vinaigrette. The wine provided a nice accompaniment to the salad course, though it was a better match to the pasta course. 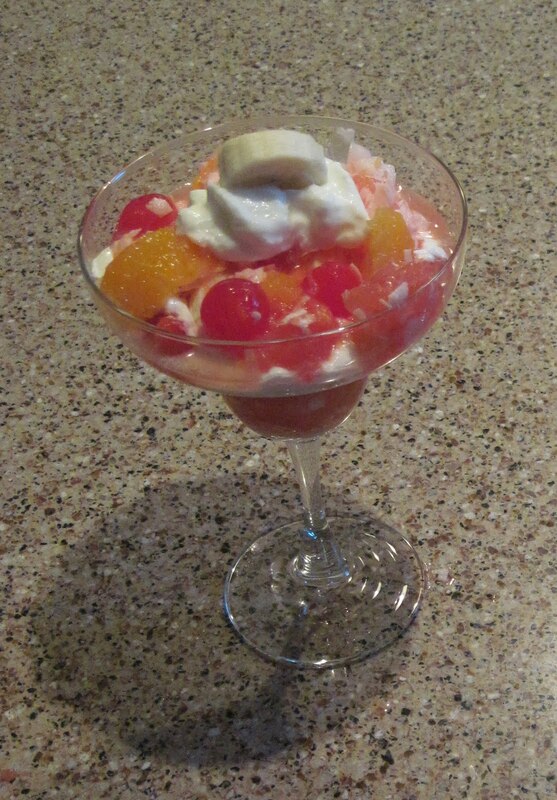 For dessert I settled on Ambrosia Citrus Salad. Yes, Ambrosia, that staple of family reunions, church suppers and college cafeteria salad bars. Most ambrosia recipes are simple canned affairs (a can of fruit cocktail, some canned mandarin oranges, etc.). This recipe calls for fresh grapefruit and oranges, which is a refreshing change. 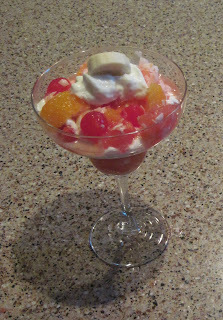 It made for a nice light dessert, and the grapefruit and oranges provided an excellent citrus bridge to the main course. I left out the miniature marshmallows, but added plain yogurt to make ambrosia parfaits. Everybody loves parfaits. On reflection, I probably would have just served the ambrosia by itself. The citrus fruit and coconut went well with the sauvignon blanc, but the yogurt tended to cover up the flavor of the wine, making for a less than perfect pairing. Preparing these meals is always a learning process and I find it helpful to do a little debrief to see what could have been done differently. First, I wouldn’t add the yogurt to the ambrosia. It can stand well enough on its own and would be a better match for the wine that way. Second, while the wilted hydroponic basil worked okay, fresh is always better. I can definitely see having this meal again in late summer, sitting on the deck in the cool evening air after picking a few fresh basil leaves right out of the garden and the wine chilling on ice. The Naked Vine is branching! Thanks to the inspiration of a few different folks (including the Sweet Partner in Crime), I'm now writing about our adventures in preparing flavorful meals that pair well with good wines. None of these meals require spending all night in the kitchen. Interested? Ease on over to The Man Who Cooks. Please let me know what you think. Any and all feedback is appreciated. Vine reader Ned D. shot me an email recently asking me about an "Old Vine" Zinfandel since he'd had one and enjoyed it recently. He asked, "So, is Old Vine Zinfandel better than regular Zinfandel?" A good question -- one that I hadn't really considered on more than a superficial level. I mean, if there's "old vine" wine, why isn't there "young vine" wine? Might as well find out, no? Like winemaking itself, the growth process of grapes is a long-term endeavor. Once planted, a grape vine needs a couple of years to get itself established and get its roots down a ways in the hopefully poor soil in which it's planted. Yes, I said, "poor." Grapes grow best in bad soil. The best grape producing vines need to struggle for sustenance. So, once a vine is at a point where it's getting steady water and nutrition, it starts producing fruit. A grapevine starts producing fruit within 2-4 years. So, after a couple of years -- you've got fruit. Well, even if a vine's producing grapes, it can take a couple more years for the vine to persistently produce grapes with a high enough sugar level so the juice can be sustainably fermented. Winemakers often do a "green harvest" (cutting some unripened clusters) on young vines to reduce the overall grape production, allowing the remaining grapes to store more sugar and juice. Even with these methods, a grape vine can take up to around 10 years to start really producing quality grapes. A vine's "production wheelhouse" is usually between 10-25 years of age. However, some particularly hardy vines chug along for decades, but produce smaller and smaller yields as time passes. After 40 years or so, the vine produces a fraction of what it used to. However, what is lost in quantity is often made up for in higher sugar level and a different quality of juice. The resulting wines are often higher in alcohol and have more complex flavors. So, what does this all this mean vis a vis Ned's wine? Zinfandels aren't for the faint of heart. These are usually rich, powerful, chewy, spicy wines. Until the early 1990's, most Zinfandel was used either for blending or to create white zin. Zinfandel producers, especially in Sonoma County, then started a push to put these big reds in the public consciousness. It worked. 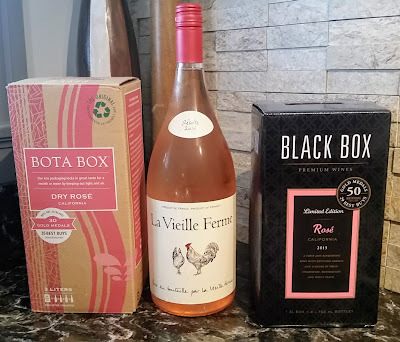 Wine drinkers, tired of merlot and cabernet, started snapping up these wines. I fell in love with Zinfandel on our first trip to Sonoma. Zinfandel (A Dark Horse 2003 Zinfandel, specifically) was the first wine that ever made my eyes pop. Many of the long-standing winemakers with access to old vines chose to produce a "regular" Zinfandel, which tended to be more powerful, fruity and straightforward, and an old vine version which, while often higher in alcohol and powerfully fruity, had more balance and more nuance. But more demand for these wines meant increased production and, in the case of the old vine zins, a "Californizing" of the wine style. Much like large producers of California chards producing ultra-buttery or ultra-oaky wines, many of the larger Zin producers began focusing on one particular aspect of the wine. Inexpensive zins became either unremarkably syrupy fruit bombs or thick, peppery alcoholic stews without subtlety. Some of these wines had more in common with jug wine than with the traditional Sonoma products. Thankfully, that era seems to be passing and even the wines from the lower price points are showing some more balance. The pattern still holds, though. For comparison, we tried a couple of zinfandels from Cline. The Cline 2007 Zinfandel ($12) certainly fits the "straightforward" category. The nose is straight up vanilla initially that eases into some spiciness and some cherry after some air. Rather than a thick fruit bomb, the body here was more approachable and tasted like vanilla covered cherries and blackberries. The finish is somewhat tannic, easing towards coffee at the end. For comparison, the Cline 2007 "Ancient Vines" Zinfandel ($16) had a more balanced (and I thought, more interesting) nose of cinnamon and clove and lighter cherry on the nose. To me, the flavors had more "structure," meaning that we tasted things more gradually, almost "sequentially," rather than getting vanillacherrysmoketannin all at the same time. The peppery notes from good Zinfandel also presented themselves more strongly. The finish felt like it was wrapping the back of my tongue with sour cherries before drifting away with a strong, coffeeish taste. We tried it with some two-bite brownies, the "Young Vines" Cline was actually better with chocolate. The immediacy of the wine's flavors took care of the cocoa more handily. Is Zinfandel the only "old vine" wine? Nope. Australia does some old vine Shiraz, which makes sense to me as both wines tend to be big and alcoholic. There are some in France and Spain as well. I haven't had the chance to try any of those, unfortunately. There's no real guideline for what constitutes an actual "old" grapevine. The general rule of thumb is "older then 45 years." Winemakers usually turn to Potter Stewart for direction -- they know it when they taste it. Since there's nothing cast in stone, the term can be applied quite loosely for marketing reasons. On my last wine store trip, I saw that the bottles of Gnarly Head Old Vine Zin had new neighbors -- Gnarlier Head Old Vine Zin. The notes for the "regular" Gnarly Head said that the wine was made from a blend of wines from 35-80 years old. The Gnarlier Head notes only say that the wine is a "single vineyard" zinfandel -- but makes no note of the age. The "Ancient Vines" we tried above is from Cline's 100 year old vines. One semi-tangential note: On the evening when we were trying the Cline wines, I was feeling lazy and the SPinC didn't want to finish her glass. (This frightened me a bit.) We'd done a side-by-side of the two wines, so I just poured them together for fun to finish up, tried it, and immediately tried to replicate it. (I was able to do it fairly easily -- about a 60/40 blend of new vine/old vine.) The whole turned out to be better than the sum of the parts. The two wines merged into a very approachable, somewhat fruity, very drinkable "cuvee" which seemed to have a better flavor balance than either of the individual wines. "It's like a black and tan!" said the SPinC. For those of you in the Dayton/Cincinnati area, I wanted to call your attention to the Adventure Summit being held at the student union on the campus of Wright State University. Best of all, it's free -- so if you're looking for things to do this weekend, give it a go! Naked Vine Note: The Naked Vine's international correspondent has decided to continue his foray into the intrepid world of wine blogging. I'm looking forward to Jeff's project. Read on and enjoy! Earlier this year, I was trying to think of a way to surprise my wife Christine on her birthday. It’s not an easy thing to do. First, she’s too smart to surprise easily, and second, she has fairly down to earth tastes. The standard jewelry, perfume or clothes would not do (though she might like a snazzy new pair of hiking boots). But she does like good food and good wine to go with it. I had recently finished off a small area of our basement as a wine/beer/hard-cider cellar and thought it would be a nice surprise to stock the wine cellar. Then, putting my head together with Mike of TNV, we hit on the idea of a dinner/wine of the month club. Mike helped me pick out twelve bottles of wine and made some general menu selections to go with them. I made a cute little certificate listing all the wines and the corresponding months and voila, Jeff’s Wine/Dinner of the Month Club was born. The kicker is that I am making the dinner each month. This is a very big thing because I don’t usually make the meals. I’m the clean-up crew in our house. My labors paid off and the evening was a big hit – so much so that it looks like this gift might be an annual thing. Follow along each month to see how it goes. I’ll provide links to the recipes when available. You might get some menu ideas, or at the very least some excellent wine suggestions from TNV. On Friday, February 26, I started preparing the meal around 2:30 p.m. and we sat down to dinner around 6:45 p.m. The meal worked out well because I could prepare the dessert ahead of time (according to the recipe even the day before) and put it in the refrigerator. I then got the lasagna sauce started and simmering while I worked on cutting up ingredients for the bruschetta and preparing the cheese filling for the lasagna. It also made it easy to clean up along the way. Did I mention I rock as the clean-up crew? About 30 minutes before we sat down to eat we poured the wine into our decanter to let it breathe. I don’t know if this wine really needed it, but I figured it couldn’t hurt and we have this nice decanter so, by golly, we’re going to use it. The bruschetta had not only mushrooms in the topping, but also red pepper, onion, garlic and tarragon. It presented a veritable mélange of rather earthy flavors, and the wine held its own and complemented the appetizers very well. Next up was the lasagna. This is a hearty recipe with ground beef and Italian sausage, three cheeses and lots of tomato products–crushed tomatoes, tomato sauce and tomato paste. It was one of the best lasagnas I have ever tasted. It was so good I forgot to drink the wine with my first serving and had to go back for seconds. It was also so good you couldn’t even tell the noodles were whole wheat. * Because of the tomato content, the lasagna presented a lot of acidity. The good tannin structure of the wine balanced this out perfectly, and we almost finished the bottle, but we needed a little something to go with the salad. We saved a little of the Monte Antico in our glass to have something to drink with our salad, which is the Italian way and nice to have near the end of the meal to cleanse the palate for dessert. The salad was a simple romaine lettuce mix with walnuts and dried cherries topped with a vinaigrette dressing. It was even more acidic than the lasagna, but surprisingly, the wine worked well with this too, though it was a bit of a struggle. We were finished with the Monte Antico, but we still had dessert to go. The panna cotta was a fairly heavy dessert, made with buttermilk, heavy cream and sugar. The sauce recipe called for reducing orange juice with some sugar and a tablespoon of brandy. Since we didn’t have any brandy in the house, I Kentucky-fied it with a tablespoon of bourbon. The dessert was delicious with the citrus sauce giving a good counterpoint to the creamy panna cotta. But, what to drink with dessert? Well, a few years ago, Christine and I went on our honeymoon in Tuscany and had some vin santo, an Italian dessert wine, and loved it. A couple years later I was in a store and saw a small bottle for about $10 so I bought it thinking it would be nice with dessert some time. I pulled it out and we tried it with the panna cotta. Let me just say that you may not be happy with a $10 bottle of aged vin santo, and leave it at that. Our bottle found its way to the bottom of our kitchen drain. Other than the vin santo incident, we both enjoyed the meal and the wine immensely. We can’t wait to see how March turns out.